So, I have to give a couple of disclaimers before I talk about the details of this outfit. After taking the pictures, I realized I had runs in my stockings, so please ignore. Next, these pictures aren't the best quality but I really wanted to show what you can do with this outfit because I love it! This was literally the most effortless outfit. As soon as I saw this hot pink skirt with ruffles I knew I had to buy it. I wasn't quite sure how I was going to style but I knew I would figure it out. See below for three ways to style. For this particular style, I added a balloon sweater from Kryz's closet. Kryz is goals for a fashion blogger who also has a store (my dream!). I love her style and this sweater is absolutely amazing. Keep in mind it is a crop sweater but not too short. I was able to tuck it in to this skirt if I wanted to wear it that way. To finish off the style I added some tights (it was a really cold, windy day) and flat boots (I had a lot of running around to do). 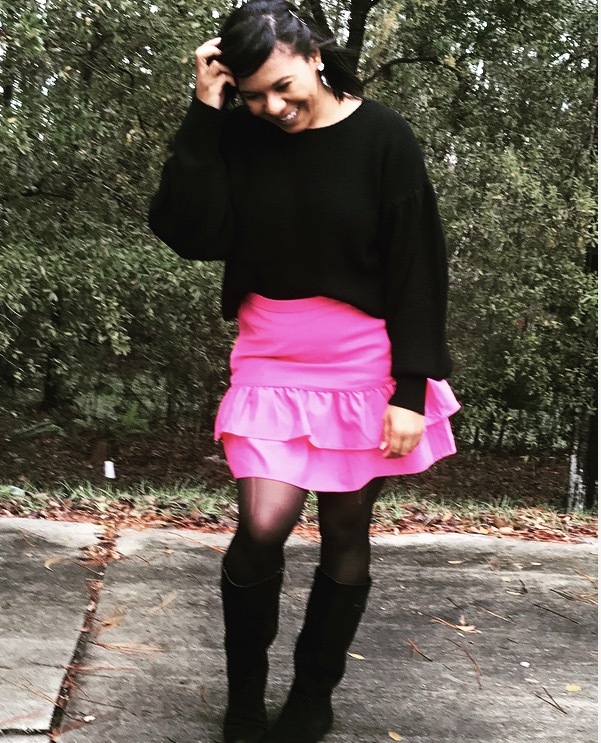 Style 1: Black Balloon Sweater + Hot Pink Skirt + Black Boots with heel or flat.